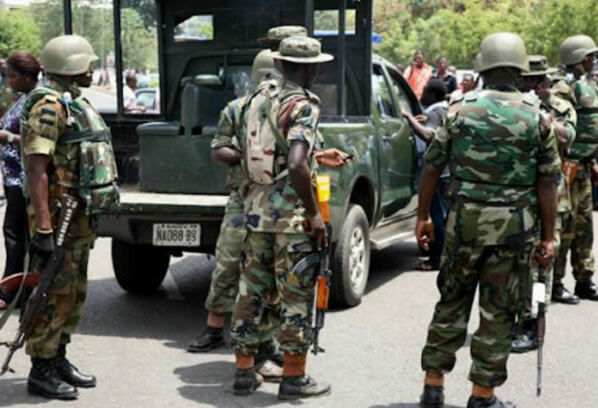 Boko Haram terrorists, in what appears to be an unending onslaught on locations of the Nigerian Army, on Wednesday evening attacked the troops’ base in Damasak, Borno State, resulting in a heavy gunfire which lasted for several hours. The army has confirmed the attack, saying troops of 145 Battalion in Damasak, withstood the insurgents and killed scores of them in the firefight. The army was, however, silent on the number of casualties sustained on the side of the troops. Damasak is a town in the Mobbar Local Government Area, some 146 Kilometres from Maiduguri, the state capital. It will be recalled that the Boko Haram insurgents only last week attacked troops’ location in Gudumbali in the Guzamala LGA and Baga in the Kukawa LGA, resulting in an undisclosed number of casualties on both sides. The army’s Director of Public Relations and Information, Brig. Gen. Texas Chukwu, on Thursday confirmed that “many Boko Haram terrorists” were killed in the attack on troops’ location in Damasak. He said, “Troops of 145 Battalion in Damasak engaged the Boko Haram terrorists who came to attack their location at about 6pm on Wednesday. This resulted into a fierce battle. “The troops engaged and subdued the terrorists in Damasak following a superior firepower. The troops’ aggressive posture, tactics and marksmanship resulted in the neutralising of many Boko Haram terrorists. “Consequently, the army wishes to state that the fight against Boko Haram terrorists in the North-East part of the country is yielding a positive result.